MEDIA COVERAGE: There will be no radio or television coverage for the Utah trip. However, the Aggies will have six home matches produced for TV by AggieVision and 14 matches on local radio. The first radio match, on Friday, Sept. 5, against Radford, will be aired on 98.7 FM, the remaining 13 radio matches will be aired on KGRT AM 570. Radio coverage includes all WAC matches not produced for TV, matches versus rivals UNM and UTEP and any NM State postseason play. The AggieVision schedule begins with both home matches of the NM State/UTEP Co-hosted Tournament. Both matches will be against top-20 teams, beginning with the first TV match of the season on Friday, Sept. 12, versus No. 18 Colorado State, followed by the match against No. 9 BYU the next day, Saturday, Sept. 13. For AggieVision channel information please contact your cable or satellite provider. 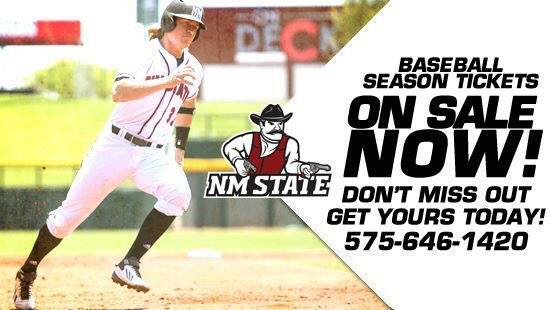 LIVE STATS ON THE WEB: Live stats will be available for fans at www.NMStateSports.com at no cost all season long. Fans can click on the ‘Live Events’ link at the top of the NMStateSports.com home page to access the live stats. LIVE WEB STREAM: All three of Utah’s matches this weekend, including the one versus NM State on Saturday, Aug. 30 at 7 p.m., will be available on a live webcast through the Pac-12 website. Please click on this link to access the webcast. SOCIAL MEDIA: Get all the updates of Aggie Athletics on Twitter and Facebook. Get in-game statistics and in-game updates on Twitter @NMStateAggies. Find out about all Aggie Athletics promotions and events on Facebook (NMSU Athletics and The Aggie Student-Athlete). Also, new this season, follow us on Instagram @NMStateAggies for photos from all the Aggie sports world. ABOUT THE AGGIES: NM State will try to make it three WAC titles in a row in 2014. It will attempt the feat with a young roster that includes six true freshman and only two seniors. The Aggies will depend heavily on three juniors, outside hitter Bradley Nash, middle blocker Gwen Murphy and setter Taylor Livoti. All three were selected to the All-WAC preseason team. Although young, NM State was still picked to win the conference regular season in the WAC preseason coaches’ poll, garnering six of eight first-place votes. THE MICHAEL JORDAN ERA: Mike Jordan enters his 17th season at the head of the Aggie volleyball program. He is the all-time winningest volleyball coach at NM State with a 352-160 record. In 2013, Jordan won his sixth Coach of the Year Award (two with the Sun Belt Conference and four with the WAC) and led the Aggies to their seventh NCAA Tournament appearance (2003, 2004, 2006, 2007, 2008, 2012, 2013). Missouri State: The Bears come out of the Missouri Valley Conference and are coached by Melissa Stokes, who begins her 19th season at the helm of the program. They finished fourth in the MVC in 2013 with a 21-11 overall record and a 12-6 conference record. Missouri State lost, 3-1, in the first round of the MVC Tournament to fifth-seeded Illinois State. They were picked to finish fourth in the conference once again in the MVC preseason poll. The Bears lost AVCA All-American setter Carly Thomas from last season’s squad, but still return four seniors including outside hitter Olivia Brand, who led the team with 283 kills in 2013. This will be the 11th meeting between the Aggies and Bears. NM State is 2-8 versus Missouri State with the last meeting coming in 1997. Montana State: The Bobcats are from the Big Sky Conference where they finished in ninth place in 2013 with a 6-25 overall record and a 4-16 conference record. Like the Aggies, Montana State will carry a young team with only two seniors and 11 underclassmen. The Bobcats do have four starters returning including sophomore outside hitter Kennadie Clute who led the team with 513 kills in 2013. This will be only the third meeting between NM State and Montana State with the Aggies winning both previous meetings, the last coming in 1993. Utah: The Utes, out of the Pac-12, are coming off a successful 2013 season that saw them make their 11th trip to the NCAA Tournament. Utah finished 21-13 and 9-11 in the conference. During their first trip to the NCAA Tournament since 2008, the Utes won their first-round match versus Yale before falling in the second round to the eventual national champion Penn State. Unlike the Aggies, Utah is a team filled with experience as it returns six seniors, including AVCA All-American outside hitter Shelby Dalton. NM State and Utah have met 35 times on the volleyball court with the Aggies holding a slight 18-17 edge. The Utes, however, have won four of the last five meetings including a dramatic five-set win in Las Cruces last season. ON THE HORIZON: After the Utah trip, the Aggies return home to host two tournaments, beginning with the NM State Tournament from Thursday, Sept. 4, through Saturday, Sept. 6. NM State welcomes North Dakota State, Radford and California to the Pan American Center. The Aggies play North Dakota State on Thursday at 7 p.m., Radford on Friday also at 7 p.m. and California on Saturday at 2 p.m. The following week NM State co-hosts a tournament with UTEP and welcomes two of the best teams in the country to Las Cruces. The Aggies play No. 18 in the nation Colorado State on Friday, Sept. 12, at 7 p.m. and No. 9 BYU on Saturday, Sept. 13, beginning at noon. Fans will also get to enjoy a match pitting Colorado State and BYU against each other to kick off the tournament on Friday at 11 a.m.
2013 RECAP: NM State finished 22-11 overall in 2013 and won its second-consecutive WAC championship after defeating Bakersfield in straight sets during the championship match of the 2013 WAC Tournament. The Aggies also won the regular-season crown, their first outright WAC regular-season title and second overall, after posting a 14-2 conference record. The WAC title meant a seventh, and second-straight, trip to the NCAA Tournament for NM State. The Aggies would go on to lose to Arizona during the first round of the tournament in San Diego. Former Aggie middle blocker Desiree Scott was named the WAC Player of the Year while head coach Mike Jordan won his fourth WAC Coach of the Year award (sixth total conference coach of the year, two with Sun Belt). Scott was also part of the WAC All-Tournament team, joining teammates Ciara Brown, Bradley Nash and Stephanie Ziegler. Fellow middle blocker Gwen Murphy joined Scott on the All-WAC first team.